It’s important to begin with theright initial basic concept for the takeaway. The first goal of the takeaway is to promote a “one-piece” movement of what I call the “Y” which is shown in the picture as lines coming down through the two arms into the shaft. A takeaway comes back in “one-piece” when the two arms and shaft move back together at a similar rate of change. In reality, the head of the club may move back a bit faster, but that is the only part of the “Y” that should move at a faster rate. The biggest mistake I see students make in their takeaway is that they are too focused on originating the movement of the “Y” with the “Y” itself. They mistakenly move the “Y” with the front parts of their body — their arms and hands. 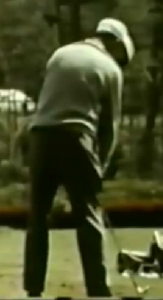 The more effective way to originate the club’s initial movement is from the rear portion of the body. To do this, mentally construct an imaginary “rectangle” formed by connecting the four points of the your two scapulas along the top and your two glutes down below. 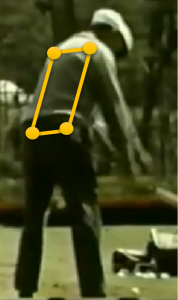 If the body’s initial movement originates with these “four corners” of this rectangle, the arms and shaft on the front side of the body will move more easily together and in sync with the full complement of the body. This is another example of how to use a “force couple” to more effectively create a desired physical movement in the swing.